make a critical difference on important issues! 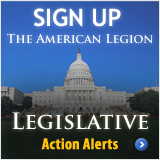 U.S. Congress - The American Legion Legislative Division is governed by a full commission and promotes the organization’s positions and recommendations to Congress, the White House, departments and agencies. The division coordinates support efforts on Capitol Hill and advises state legislative councils as they deliver the Legion message across the country. An annual portfolio of priorities is produced and presented to Congress from the national commander and chairmen of the Veterans Affairs & Rehabilitation and Legislative commissions. The portfolio, based on national resolutions, serves as a guide for volunteers and staff to use when meeting with elected representatives. The Legislative Action Center provides members an online gateway of information to track bills and follow developments in Washington. Virginia General Assembly - The Joint Leadership Council of Veterans Service Organizations (JLC) provides a vehicle for veterans service organizations to collaborate with the Department of Veterans Services on meeting the needs of Virginia's veterans. Click HERE to review the legislative objectives that were adopted by the JLC for the 2012 legislative session of Virginia's General Assembly. These are the prioritized objectives of the 23 Veterans Service Organizations represented on the JLC. Contact your State Delegate and Senator and relay your support for these initiatives on behalf of Virginia's over 800,000 veterans. For more information, please contact: Steven Combs, 804-786-0294, Steven.Combs@dvs.virginia.gov. 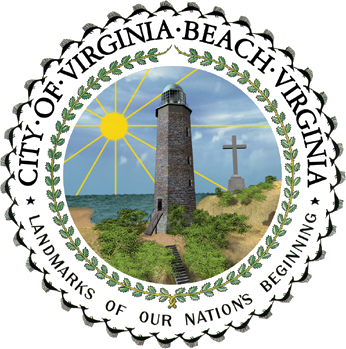 City of Virginia Beach -The City of Virginia Beach operates under the Council-Manager form of governmnet. The 11 member City Council is the City's governing body. Members of theCity Council serve four-year terms and are elected on a staggered basis. Beneral elections are held the Tuesday following the first Monday in November in even-numbered years. All registered voters are eligible to vote for all members of City Council. Three Council Members and theMayor serve "at large" with no district residency requiremehnts. All other Council Members are required to live in the districts they represent: BAYSIDE, BEACH, CENTERVILLE, KEMPSVILLE, LYNNHAVEN, PRINCESS ANNE, and ROSE HALL. Council meetings are cablecast live on VBTV Cox Cable channel 48, Verizon Cable channel 45, and on VBgov.com's media center. The meeting is recablecast on Cox channel 48 and Verizon channel 45 the following Thursday at 7:00 p.m.; Friday at 9:00 a.m.; and Sunday at 9:00 a.m. View the Current Session of the Virginia Beach City Council via estream.